Freddy was born in Ciego de Avila, Cuba. He learned how to cook at the age of fourteen, inspired by his uncle Ishmael, an Executive Chef for twenty years at Sevilla Hotel in Havana. Freddy also drew inspiration from his grandmother who was a cook in the sugar cane industry in Cuba. 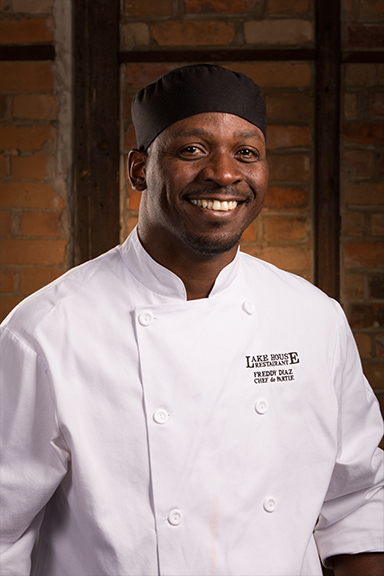 In 2009, Freddy began his professional career in Canada as a dishwasher at Hell’s Kitchen Restaurant while learning English. He quickly advanced to a prep cook position, and then into a pizza chef in two short years. Freddy always had an interest in Italian cuisine so when a position opened up at the famous Carmelo’s Ristorante in West Vancouver, he jumped on it. This opportunity provided Freddy with the ability to hone his techniques in fine dining Italian cuisine. In 2014, after the birth of their twins, Freddy was introduced to Central Canada, choosing St. Catharines as their new home. Fortunately, he found a new home also at Lake House, finding an opportunity to expand his culinary horizons. Freddy very quickly proved himself in the Lake House kitchen and has become a valuable part of our team. Freddy’s continued commitment to excellence made it evident that he was the right person to be promoted to Chef de Partie of the Pizza and Hot Appetizers section.